The remark did raise quite a few eyebrows. Later the minister insisted that he hadn't misquoted Stephen Hawking. 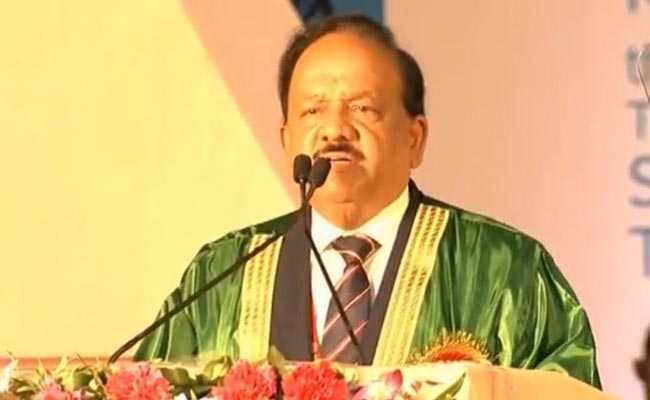 Harsh Vardhan tweeted a picture of him at the Indian Science Congress. Imphal, Manipur: Harsh Vardhan, the genial science minister has quoted British physicist Stephen Hawking to back claims that Vedas are essentially are a theory of everything. The minister today said that the cosmologist, who passed away this week, had said the Vedas have a theory that is superior to Albert Einstein's equation. "Stephen Hawking said on record that our Vedas may have a theory that is superior to [Einstein's] E=MC2," Dr Vardhan told a gathering of 5,000 delegates at the Indian Science Congress. A celebrated German-born theoretical physicist, Albert Einstein's equation says implies that mass and energy are the same but in different forms. "This is certainly not a place for to relay exaggerated tales," the country's genial science minister said, and advised reporters to find the original source of this information. If you can't find while you are in Imphal, come to me in Delhi and I will tell you the exact source," he said, a little patronisingly. NDTV then turned to some prominent scientists who had closely tracked Stephen Hawking's work for decades. Sandip Trivedi a well-known string theorist and Director of the Mumbai-based Tata Institute Fundamental Research, said this was the first time that he was hearing about it. "I am not aware of any such comment by Stephen Hawking," he told NDTV. Tarun Souradeep, another well-known cosmologist from the Inter-University Center for Astronomy and Astrophysics too was surprised. "I have never heard of such a claim by Hawking," he said. Some scientists suggest that Stephen Hawking, a genius who dedicated his life to unlocking the secrets of the universe, was a quirky person and may have made some assertions in his talks and writings that were outlandish. A quick search on the Internet revealed a post on the website hosted by the Institute of Scientific Research on Vedas, or I-Serve, that claims to be a scientific research institute and, according to the website, is registered as a charitable non-profit trust. The institute's website says it is dedicated to digging out the technical details of Vedic sciences from ancient Indian literature. This website has a page, which claims Stephen Hawking had referred to science books authored by the I-Serve organizing secretary, Dr. Sakamuri Sivaram Babu, in 2011 and said that "Vedas might have a theory superior to Einstein's law.